Charge Nurses are accountable for overseeing specific departments within a healthcare facility during the assigned shifts. Charge Nurses are involved in executing tasks such as – delegating nursing assignments, overseeing admissions and discharges, preparing schedules, monitoring and ordering medicines and carrying out patient load depending on work and shift activities. 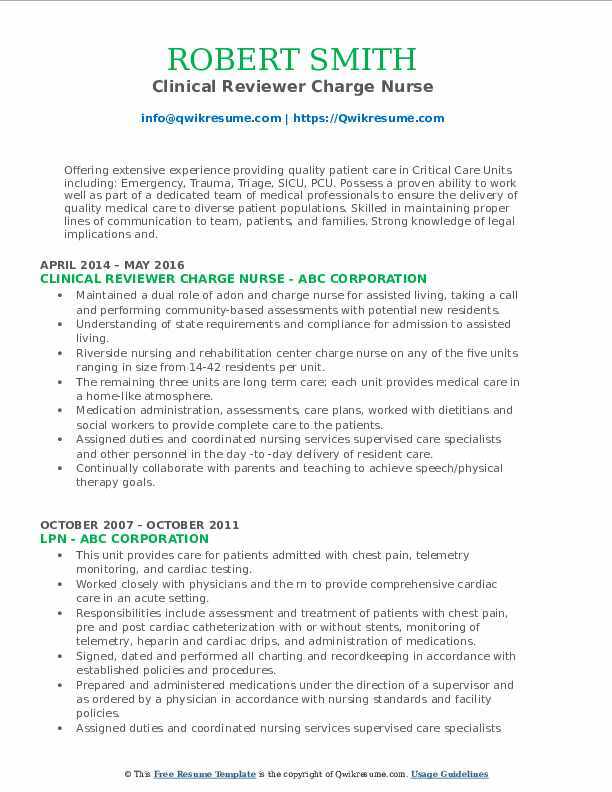 The Charge Nurse Resume also emphasizes the following tasks – planning budgets for nursing staff, providing clerical assistance to hospital staff, and performing all other nursing duties as assigned. 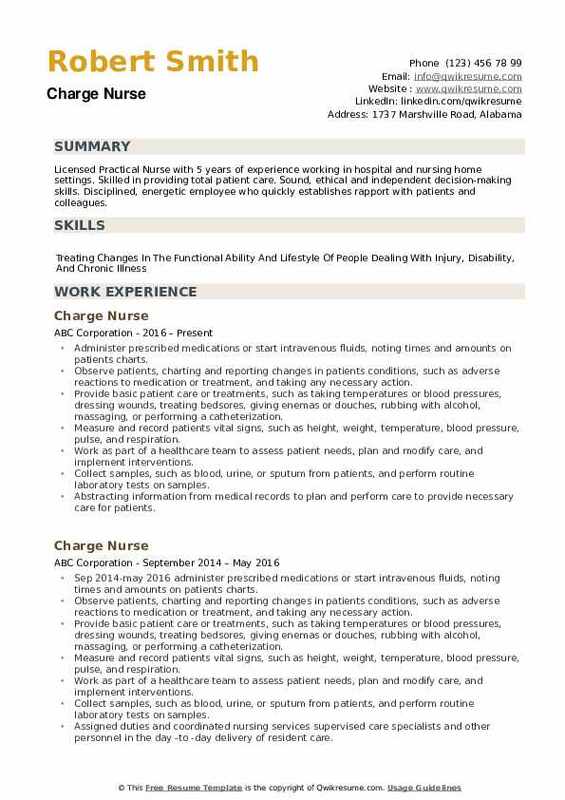 As a Charge Nurse, the candidate should be able to balance well both administrative and clinical care, they should have documentation skills and possess the ability to evaluate the performance of the nurses under their supervision; excellent communication and interpersonal skills are crucial for this role. A college degree in Nursing is necessary, additional qualifications include an Associate’s degree or a Valid Nurse Certification. Headline : Compassionate Registered Nurse with fifteen years of professional experience in health care. Skilled in excellent patient centered care, high-quality customer service, and the ability to motivate healthcare teams working in acute, chronic and high patient volume settings. Skills : Strong Clinical Judgment, Patient Positioning, Patient Evaluation/intervention, MEDISOFT, Safe NG Tube Insertion And Removal, Medication Administration Thorough Physical Assessments, Oxygen Administration. Managed team of medical support personnel. Evaluated patient care needs, prioritized treatment and maintained patient flow. Skillfully performed suture removals for patients. Maintained patient charts and confidential files. Assessed patients in active withdrawal and provided interventions to manage physical and psychological withdrawal symptoms. Provided education to patients on detox and withdrawal, medications, addiction, recovery, coping skills and community resources. Partnered with a team of health care professionals to ensure the overall well-being of all patients. Assisted patients with multiple chronic diagnoses including chronic obstructive pulmonary diseases and asthma. Provided behavioral/emotional support and supervision for those with mental health care needs. Treated patients with strokes, head traumas, and intracranial hematomas. Provided patient diagnosis under strict time constraints. Performed all tasks with a patient-centered focus while seeking opportunities for improvement of processes and treatments. 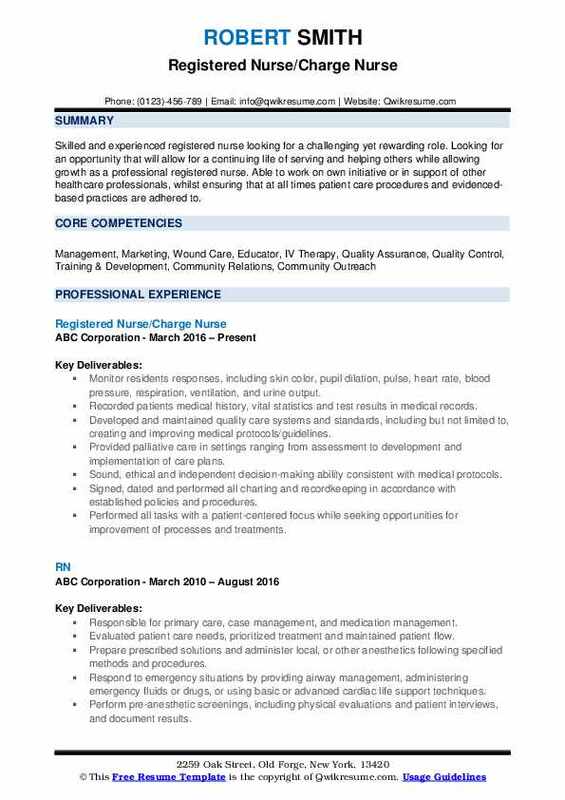 Summary : Skilled and experienced registered nurse looking for a challenging yet rewarding role. Looking for an opportunity that will allow for a continuing life of serving and helping others while allowing growth as a professional registered nurse. Able to work on own initiative or in support of other healthcare professionals, whilst ensuring that at all times patient care procedures and evidenced-based practices are adhered to. Monitor residents responses, including skin color, pupil dilation, pulse, heart rate, blood pressure, respiration, ventilation, and urine output. Recorded patients medical history, vital statistics and test results in medical records. Developed and maintained quality care systems and standards, including but not limited to, creating and improving medical protocols/guidelines. Provided palliative care in settings ranging from assessment to development and implementation of care plans. Signed, dated and performed all charting and recordkeeping in accordance with established policies and procedures. Acted as the patient advocate and implemented total patient care through a team nursing process covering 8-10 high acuity patients per shift. Objective : Four years in the medical field, four years as License Practical Nurse. 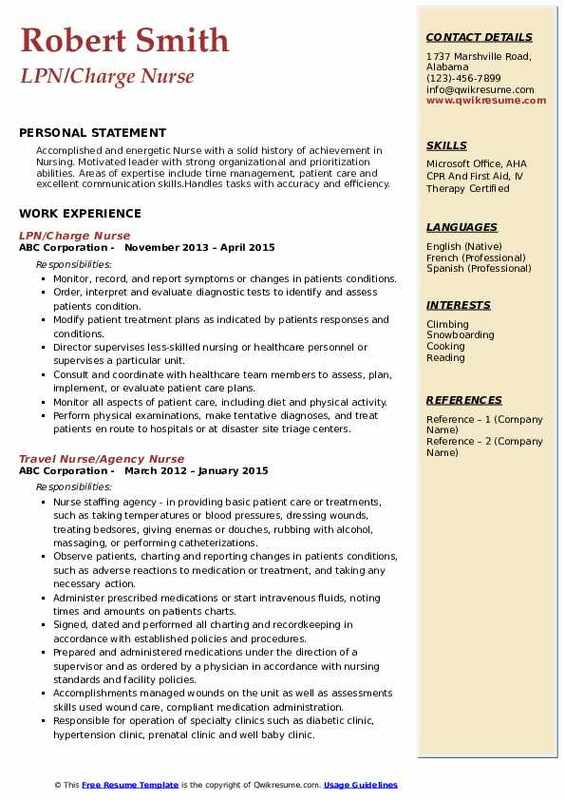 Loyal and collaborative LPN with steadfast commitment to quality care. Possess sound, ethical, and independent decision-making ability, consistent with medical protocols. Experienced with various medical conditions including but not limited to CHG, COPS, Diabetes, Asthma, Parkinson's, as well as various orthopedic procedures. Serve as a resource in an interdisciplinary team to ensure quality patient care. Develop an individual care plan to meet patient needs and achieve treatment goals. Document and report patient assessment data to the physician on a daily basis. 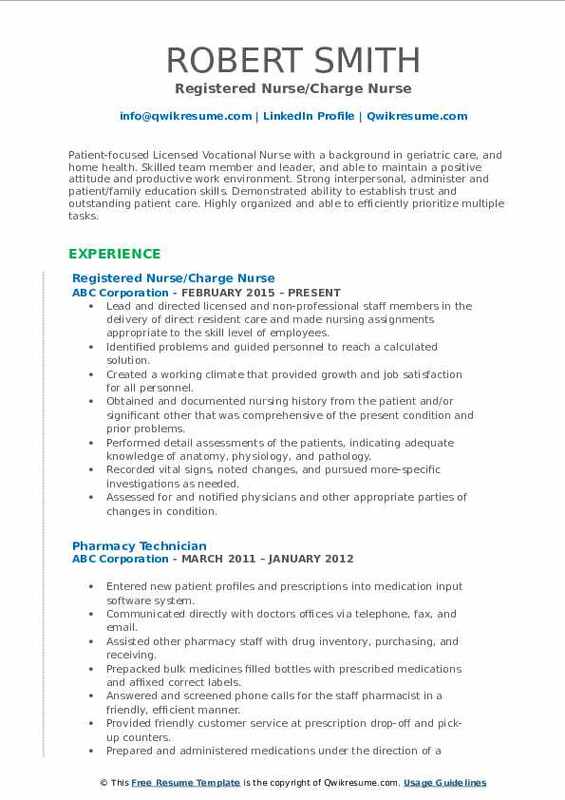 Summary : Patient-focused Licensed Vocational Nurse with a background in geriatric care, and home health. Skilled team member and leader, and able to maintain a positive attitude and productive work environment. 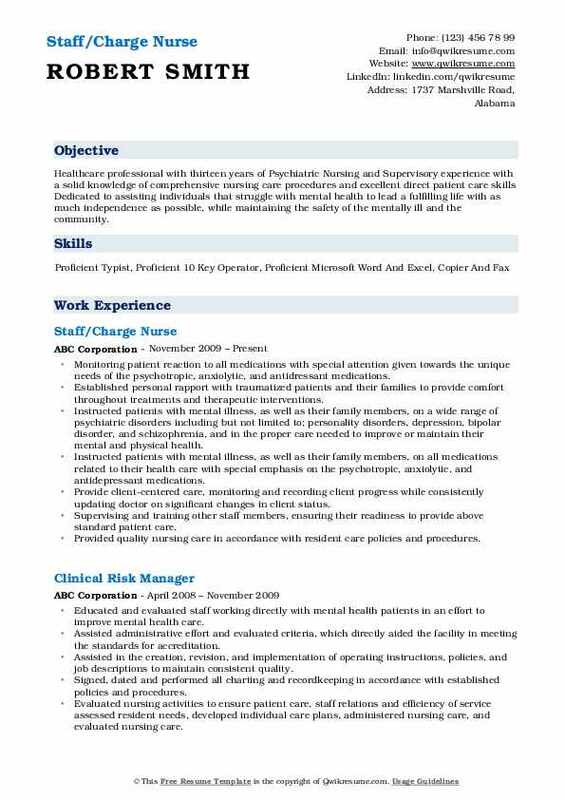 Strong interpersonal, administer and patient/family education skills. 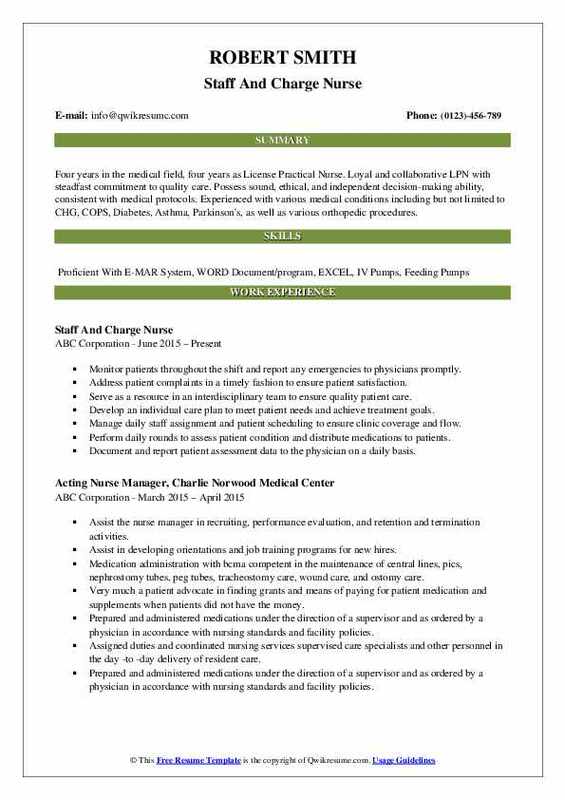 Demonstrated ability to establish trust and outstanding patient care. Highly organized and able to efficiently prioritize multiple tasks. Skills : Proficient In Microsoft Word, Excel, Publisher, Power Point. Lead and directed licensed and non-professional staff members in the delivery of direct resident care and made nursing assignments appropriate to the skill level of employees. Identified problems and guided personnel to reach a calculated solution. Created a working climate that provided growth and job satisfaction for all personnel. Obtained and documented nursing history from the patient and/or significant other that was comprehensive of the present condition and prior problems. Performed detail assessments of the patients, indicating adequate knowledge of anatomy, physiology, and pathology. Recorded vital signs, noted changes, and pursued more-specific investigations as needed. Assessed for and notified physicians and other appropriate parties of changes in condition. Completed assessment information to develop a care plan before the end of duty time, which communicated enough information for incoming personnel to adequately care for the patient. 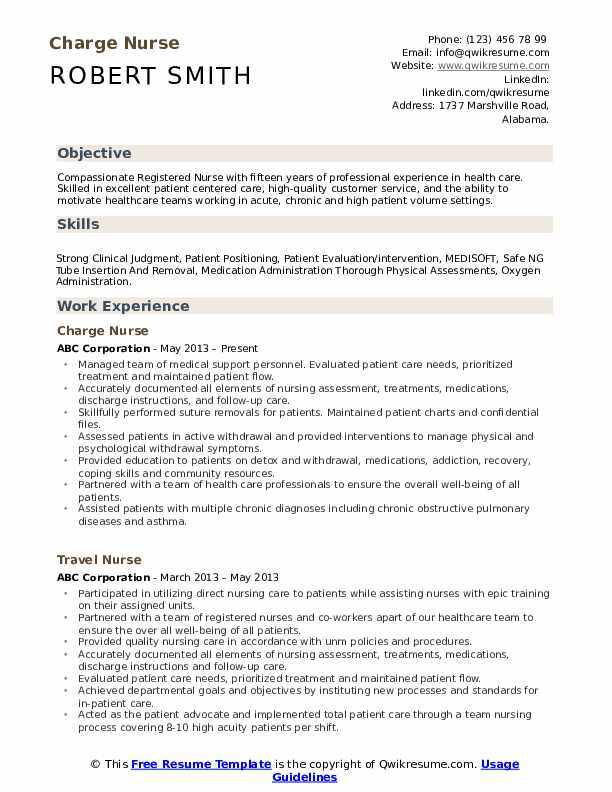 Summary : Healthcare professional with thirteen years of Psychiatric Nursing and Supervisory experience with a solid knowledge of comprehensive nursing care procedures and excellent direct patient care skills Dedicated to assisting individuals that struggle with mental health to lead a fulfilling life with as much independence as possible, while maintaining the safety of the mentally ill and the community. Monitoring patient reaction to all medications with special attention given towards the unique needs of the psychotropic, anxiolytic, and antidressant medications. Established personal rapport with traumatized patients and their families to provide comfort throughout treatments and therapeutic interventions. Instructed patients with mental illness, as well as their family members, on a wide range of psychiatric disorders including but not limited to; personality disorders, depression, bipolar disorder, and schizophrenia, and in the proper care needed to improve or maintain their mental and physical health. Instructed patients with mental illness, as well as their family members, on all medications related to their health care with special emphasis on the psychotropic, anxiolytic, and antidepressant medications. Provide client-centered care, monitoring and recording client progress while consistently updating doctor on significant changes in client status. Supervising and training other staff members, ensuring their readiness to provide above standard patient care. Provided quality nursing care in accordance with resident care policies and procedures. Summary : Offering extensive experience providing quality patient care in Critical Care Units including: Emergency, Trauma, Triage, SICU, PCU. Possess a proven ability to work well as part of a dedicated team of medical professionals to ensure the delivery of quality medical care to diverse patient populations. Skilled in maintaining proper lines of communication to team, patients, and families. Strong knowledge of legal implications and. Maintained a dual role of adon and charge nurse for assisted living, taking a call and performing community-based assessments with potential new residents. Understanding of state requirements and compliance for admission to assisted living. Riverside nursing and rehabilitation center charge nurse on any of the five units ranging in size from 14-42 residents per unit. The remaining three units are long term care; each unit provides medical care in a home-like atmosphere. Medication administration, assessments, care plans, worked with dietitians and social workers to provide complete care to the patients. Assigned duties and coordinated nursing services supervised care specialists and other personnel in the day -to -day delivery of resident care. Continually collaborate with parents and teaching to achieve speech/physical therapy goals. 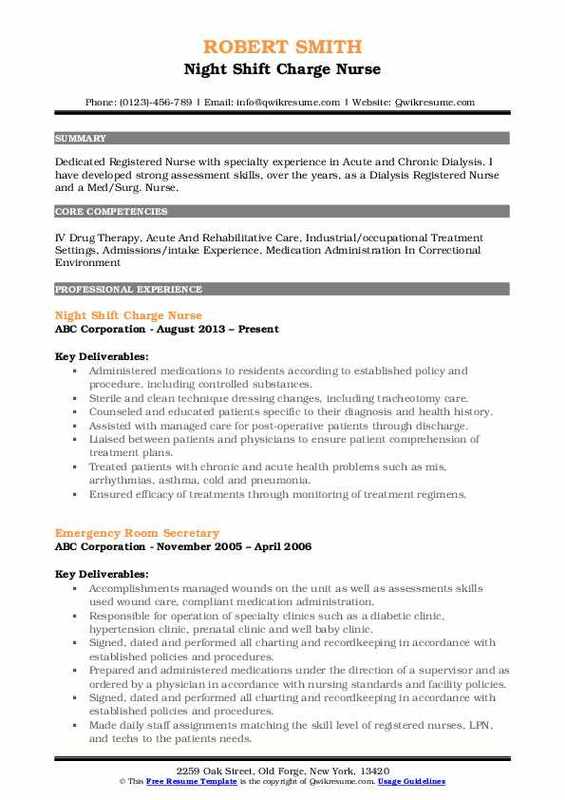 Summary : Dedicated Registered Nurse with specialty experience in Acute and Chronic Dialysis. I have developed strong assessment skills, over the years, as a Dialysis Registered Nurse and a Med/Surg. Nurse. Administered medications to residents according to established policy and procedure, including controlled substances. Sterile and clean technique dressing changes, including tracheotomy care. Counseled and educated patients specific to their diagnosis and health history. Assisted with managed care for post-operative patients through discharge. Treated patients with chronic and acute health problems such as mi's, arrhythmias, asthma, cold and pneumonia. Performed skilled sterile/clean treatment changes and medication passes for state surveys. Objective : Accomplished and energetic Nurse with a solid history of achievement in Nursing. Motivated leader with strong organizational and prioritization abilities. Areas of expertise include time management, patient care and excellent communication skills.Handles tasks with accuracy and efficiency. Order, interpret and evaluate diagnostic tests to identify and assess patient's condition. Director supervises less-skilled nursing or healthcare personnel or supervises a particular unit. Objective : Licensed Practical Nurse with 5 years of experience working in hospital and nursing home settings. Skilled in providing total patient care. Sound, ethical and independent decision-making skills. Disciplined, energetic employee who quickly establishes rapport with patients and colleagues. Provide basic patient care or treatments, such as taking temperatures or blood pressures, dressing wounds, treating bedsores, giving enemas or douches, rubbing with alcohol, massaging, or performing a catheterization. Abstracting information from medical records to plan and perform care to provide necessary care for patients.